The pintle straps just need to be bent. It is not hard, I can open them out with my hands. Good morning. The Duckworks motor mount is perhaps the best looking and option I have seen. I like that it can be removed. Price is no worse than others I have seen. I did try expanding the pintle straps. It could be done, but the holes closest to the spine were at the edge of the rudder head. I think I will return these and get the next size up. The pintles that I got from B&B were wider than 1". They were about 1 1/2" I think. The top one was about right and the bottom had to be opened as Graham said. The holes are well away from the edge. My poor old hands needed help to open it up. I don't know if they were the "RL 390" ones or not. Round over a 2x4's edges and pound the pintle straps on/over this edge, with a dead blow or hard mallet. It'll spread the straps easily and you can pound them down, to the 2x4, getting the new width and shape worked in, as you fantasize about taking out the frustrations, of the latest visit from the mother in law (okay, it's how I handle it and likely why I don't have to holler any more). Apparently there is a 1" version of the RL390 and a 1 3/8" version. I was not aware of that until last night. It is not a problem to exchange 1" for 1 3/8" so that is sorted. If the new ones need a good hammering, there any number of past experiences I can draw upon for inspiration. I was hoping to get top sides painted while I was on my two week sabbatical, but fell short. Timely advice, Docpal. I ordered the Duckworks mount over the winter, will be installing soon. I hadn't realized I'd need a notch. Darn. 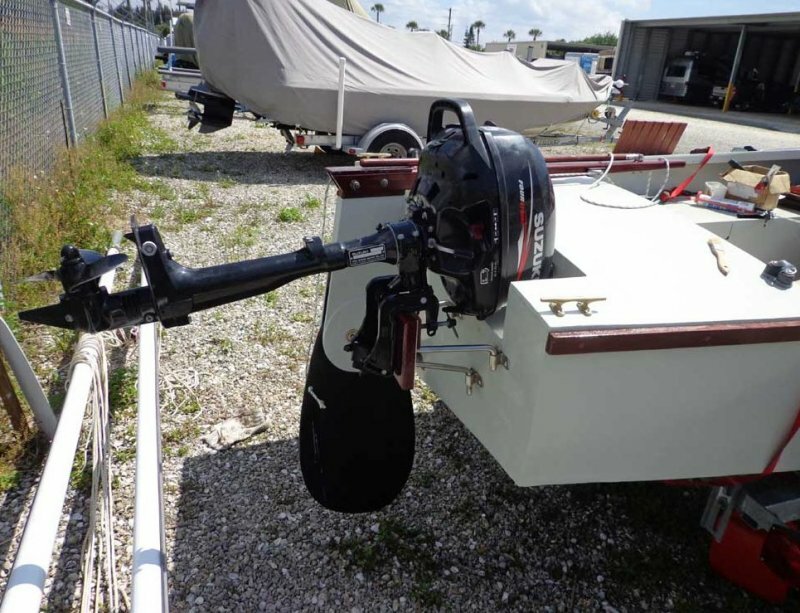 I haven't yet put motor on mount, mount on boat. We'll see. It falls under the usual category: nothing is easy. The mount is slick, tho. The mount is really nice. Keep me posted fit and modification required. I am going to delay on this. It is not critical at this point. When setting up the mount there are a couple of things to consider: you want to be sure that you have it low enough to get the cavitation plate well below the surface of the waterline so that when pitching/rolling you don't wind up in the air on every wave. Yet you also can't have it SO low that you can't reach the shift/fuel levers,OR have the throttle arm get jammed in the upright position.There must also be enough clearance to turn the entire motor 180 degrees for your 'reverse gear'. And then you need it to be far enough away from your rudder so that you don't take a bite out if it with your prop when making sharp turns. As shown in the above pictures it will/can occasionally snag the mizzen sheets when tacking, but I think that's also true of most transom mounted motors on CS hulls I've seen. And when you cut your 'notch' try to angle the bottom of the cut out so that it angles aft and will therefore drain any water quickly so you don't wind up with accumulated puddles in there. Thanks again, DP. 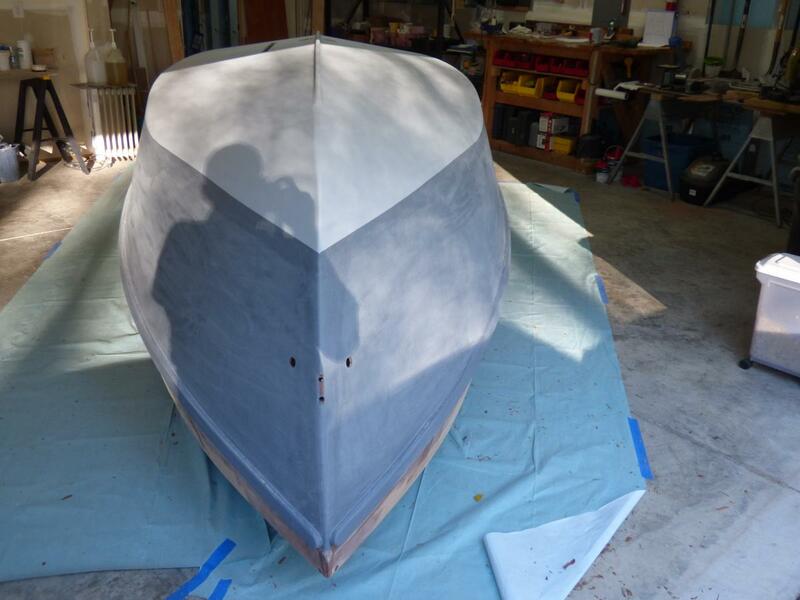 Will be doing mockups soon, and then making the (cringe) final cuts into that glorious transom. Paul, FWIW, I bought one of those mutli-tools. I bought a Dremel brand, but I think they area ll pretty similar. for this kind of surgery, it's a perfect tool. You can plunge cut very precisely and cut to a line accurately. The blades are expensive, and fiberglass eats them up quickly, but this won't be as bad a job as you think with one. Once you use a Rockwell or other higher end multi tool, you'll toss the lacking chunias Dremel. Use a diamond blade (like a tile saw) on 'glass work, as the saw styles will dull very quickly. Thanks for the tip on the Carbide tool blade PAR. The Dremel I bought got very good reviews (http://www.amazon.com/Dremel-Multi-Max-Oscillating-Quick-Lock-Accessories/dp/B010T0G9I2/ref=sr_1_2?ie=UTF8&qid=1459859284&sr=8-2&keywords=dremel+multi-tool) . I dial it down and run it on the lower end of it's power most of the time. I borrowed my FIL's Fein and it was the emperors new clothes to me. But I don't do this for a living. People gasp that I have Ryobi cordless drills, but I've built a big deck, remodeled numerous rooms in the house and they keep kicking. The key point about the multi-tool is what a great plunge cut device they are. I agree, I use a multi tool for a lot of things and the flush or plunge cut is damn handy. I recently had to remove the "limiter caps" on some carburetor mixture screws. Usually I put a soldering iron on the cap and they can be pried off, but I broke two of the three. Well, now I had mixtures screw in a shallow hole that I couldn't get a file into for making a slot., so I cut one of the fine multi tool blades, so it would fit in the hole and on low, scratched enough of a slot, to allow a flathead screwdriver to back out the mixture screws. I find that for drills it doesn't matter what brand. I use Ryobi because the batteries last (not charge, but survival time till shot) longer than DeWalt. Because they are cheap and I find I abuse them (drop them). But for a multi-tool I chose Fein. But then I bought mine before there were knock-offs. I find that reasons to use a multi-tool increase drastically once you own one. I once cut a 30" X 60" hole in a bulkhead in a Benetau 57 such that the removed piece became the door to hidden a washer-dryer installation. This way the flush door grain lined up as if it were factory built. It was tedious, but came out beautiful. I am always surprised how accurate one can be with these things if you take your time, use straight edges, etc.. I will be in a position to re-roll the boat in a week or so. 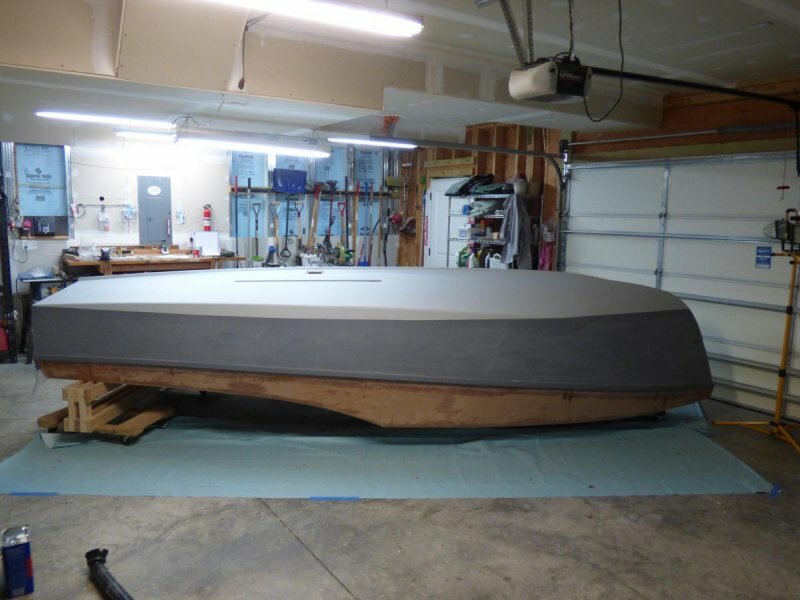 When is the proper time to install the centerboard. 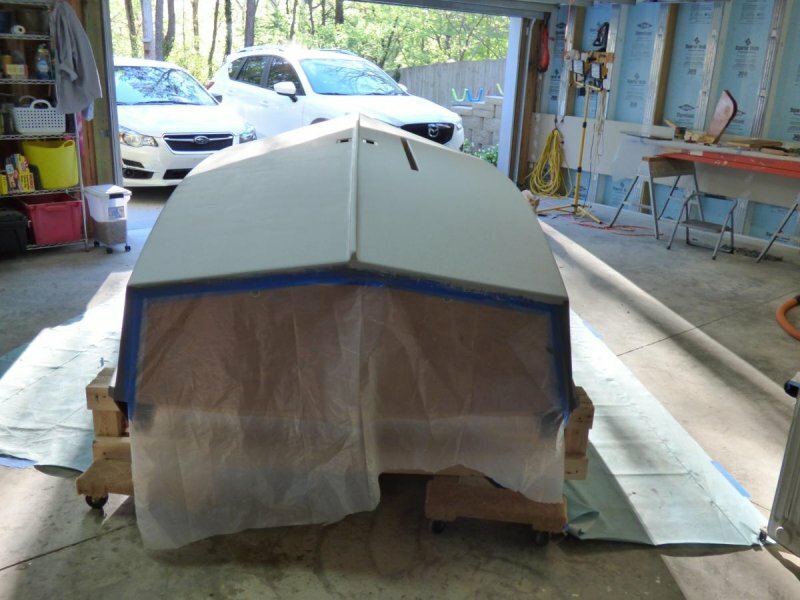 I just did mine with the boat almost finished. I thought it was going to br tough, but it was easy. With the boat painted, you can do your c/b lift when you insert your board. Drop a small line down through the hole in the top of the trunk and tie your lifting pennant to it, then pull the pennant up through the hole. Actually inserting the board takes two people. One underneath to lift the board (Let's say that it's you. ), another inside to insert the pin (Miss Debbie helped me). He or she can use a flashlight to look into the pivot pin hole to see when the hole in the board is lined up properly. It helps if you draw an "+" over the hole in the board. He can see where the "+" lines are and direct you in which way to move the board. Start it all the way to the top and forward. Did you install your bailer while upside down? Or at least cut the hole for it? I waited until the end for mine. It would have been easier to cut the hole while upside down. Countersink for the "dimples" where the mounting screw holes in the bailer will hit. Epoxy coat the cutout and dimples. Thank you. I cut the holes for the bailors ( One in , no penent, and one out). They will be installed this week. Thank you for the heads up on the board. That makes me feel better. I did not like the idea of flipping the boat with the board installed. I could imagine all sorts of problems. Was your boat on a trailer when you installed the board or still on casters in the ship. We plan to roll it and put it on the trailer. Mine was on the cradle when I installed the board. Still is. The center cross brace of the cradle is a handy place to rest the board on. 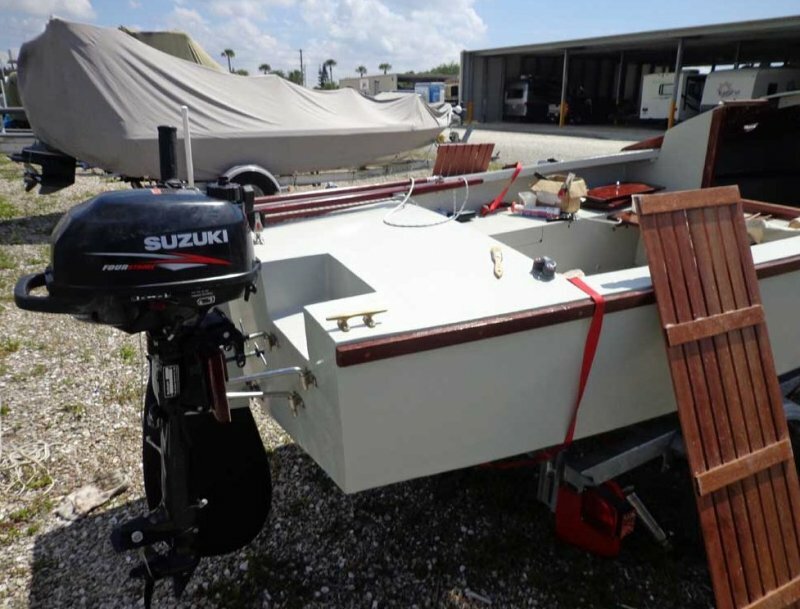 I think that completing the boat on the cradle is easier than on a trailer with tongue and fenders to trip over. I'll load mine onto the trailer to step the masts and complete the rigging. That's only because I cant roll the cradle on the gravel driveway. I agree working from the cradle would make more sense. We are in a time crunch I can only round up a half dozen people so often. I expect I will regret this but we need to keep moving. At least the boat will be mobile.